Why settle for a no-name alternative? Energizer has the quality you expect! Experience the freedom of getting away from it all -- but not your devices! The PowerKeepTM WANDERER is a stylish, lightweight hydration backpack. Best of all, PowerKeep WANDERER harnesses the sun to charge smartphones, tablets, Go Pro, wireless headphones and other mobile electronic devices on the go, so you can start charged, stay charged, and most importantly - STAY CONNECTED - no matter where your adventure takes you. Perfect for hiking, biking or fishing, this rugged daypack is equipped with plenty of pockets for maps, licenses or other documents, water bottle sleeves and sizable compartments for any other outdoor gear. To charge your device, use the powerbank or attach directly to the solar panel. Recharge your smartphone in 2.5 hrs from powerbank. Then, when your powerbank is running low, you can charge it up using the solar panel, USB port or wall outlet. Plenty of ZIPPERED COMPARTMENTS and interior pockets for maps, licenses or other documents, water bottle sleeves and places for other outdoor gear. Side pockets to carry water bottles. 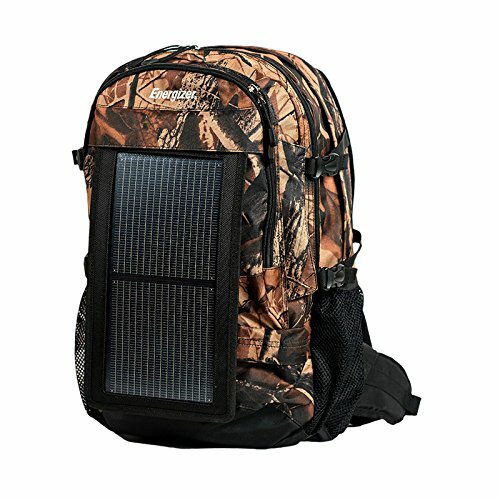 Stow the powerbank and cable in the convenient pocket on the back of solar panel or inside the backpack. Backpack has COMFORTABLE, PADDED SHOULDER AND CHEST STRAPS designed to relieve pressure on your back. REMOVABLE SOLAR PANEL IS DURABLE, LIGHTWEIGHT AND FLEXIBLE unlike conventional solar panels. A clean energy solution. RUGGED CONSTRUCTION-available in red, green, camo colors. If you have any questions about this product by PowerKeep, contact us by completing and submitting the form below. If you are looking for a specif part number, please include it with your message.